I am working on a project on infinite idealizations in physics based on my dissertation and previous publications. The main case studies include first-order phase transitions, critical phenomena, spontaneous symmetry breaking, the Aharonov-Bohm effect, and the emergence of anyons in the fractional quantum Hall effect. I suggest that infinite idealizations play an exploratory role in science and make connections to issues regarding scientific understanding, scale, and emergence. There are interesting analogies to be drawn between the literature in philosophy of science and the literature in aesthetics and philosophy of art on issues such as representation, fictions, and the imagination. Part of my research consists in identifying such analogies, as well as making connections with thought experiments and impossible objects. The so-called easy road to nominalism, espoused by nominalistic scientific realists, would allow the nominalist to embrace scientific realism, reject platonism about mathematical objects, and to do so without undertaking the daunting task of excising mathematics from our best physical theories (as famously attempted Hartry Field). I am working on making connection between infinite and ostensibly essential idealizations in physics, on the one hand, and mathematical explanation, the enhanced indispensability argument, and the easy road nominalism debate, on the other hand. The main idea is that there is a kind of explanatory symmetry between indispensible idealizations and mathematical objects in certainty explanatory contexts. 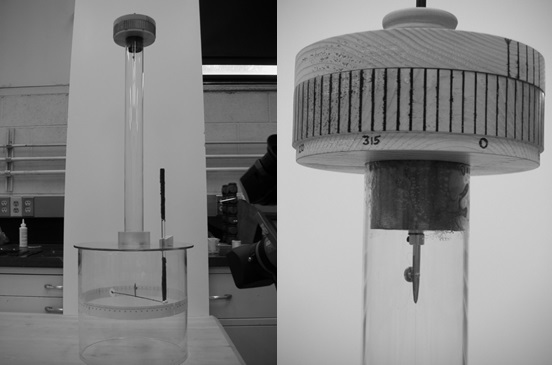 The equipment used in our replication of Coulomb’s torsion balance experiment. Left: the complete balance. Right: detail of the micrometer and the clamp holding the silver wire.